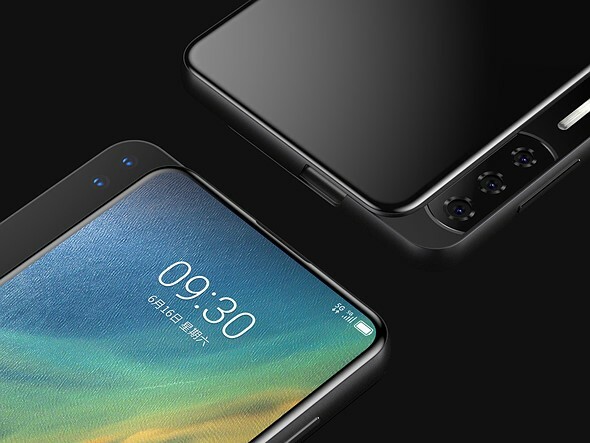 Last year we witnessed the appearance of upwards-sliding mechanisms and hole-punch displays on smartphones, both technologies designed to conceal the front camera and maximize the screen-to-body ratio. 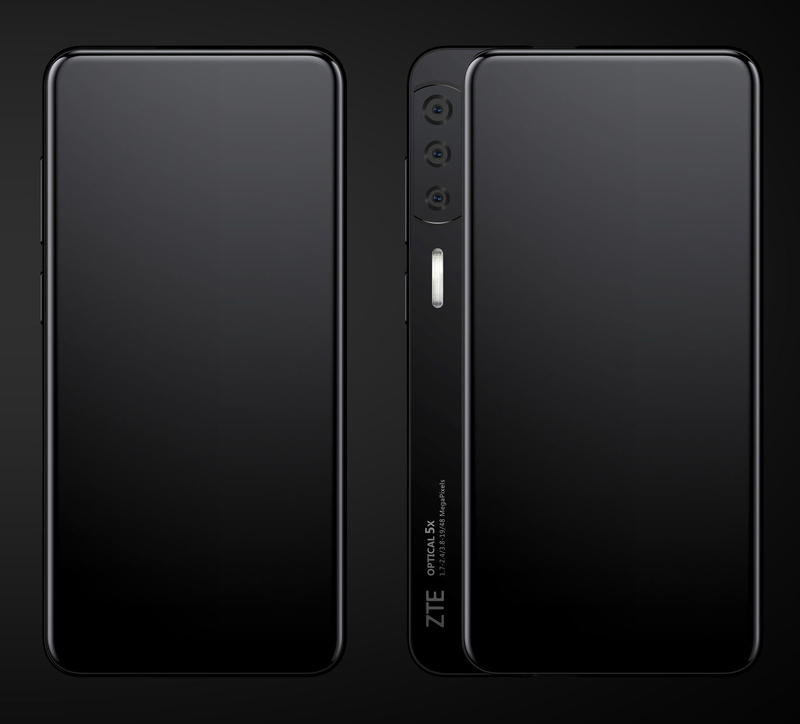 Now it looks like Chinese manufacturer ZTE has come up with a modified version of the sliding mechanism. If the images posted by Italian publication Notebook Italia are genuine, the company's upcoming high-end model Axon S will feature a sideways-sliding mechanism that hides both front and rear cameras. 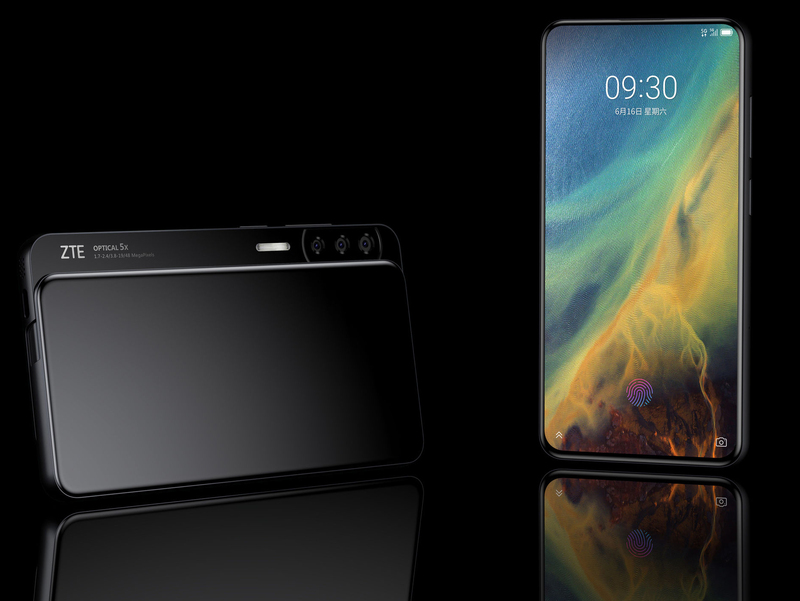 The advantages of the latter aren't quite clear (as no additional display surface is freed up) but the feature definitely results in a design that makes the Axon S stand out from the crowd. 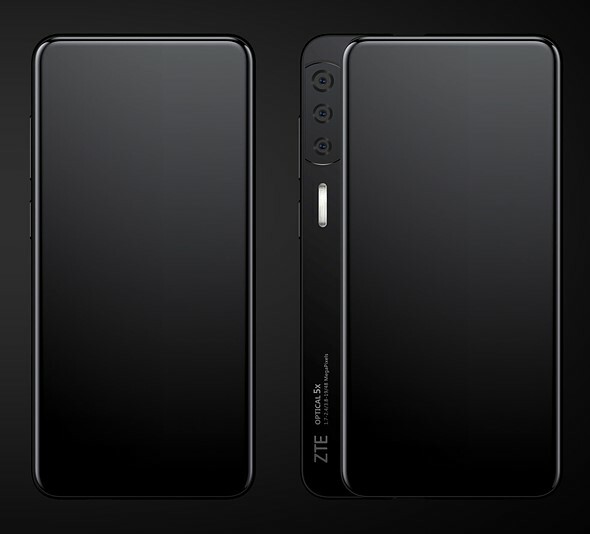 Labels on the device indicate the three cameras on the rear will include a 48MP primary unit and a 19MP secondary tele lens with 5x optical zoom. The primary camera will have an adjustable (F1.7-2.4) aperture and the tele camera module comes with an F3.8 aperture. The specifications of the third camera aren't quite clear. We don't know if or when the Axon S will be released or how much it will cost, but the device could be something to look forward to, both from a design and camera specification point of view. Omg ! Xenon flash return to smartphone !! Not practical. Just picture the grit in the slider. How do you fit a protector. Phones are too thin to properly fit any kind of cam... Now they take away another 3mm? Statics are compromised aswell. Filed this in my cylindrical drawer which gotten awfully full lately.
" Just picture the grit in the slider" was the issue of the SONY sliding cameras back to then. "The advantages of the latter aren't quite clear" - one advantage is that the cameras will most likely be clean most of the time. However I like that most flagshpis are IP68 sealed, meaning no water damage and also more sturdy cases. With the flip-flaps it is unlikely to be able to keep the luxury. No full time spying on me as a bonus. I'll wait for the next iteration: With the press of a button, the phone transforms itself into a small DSLR. It's perplexing to me why Canon has not jumped on making lenses for smart phones. It is not a small market for them to sneeze at, and they could've been the market leader for such lenses. I don't think the know how has much to do with it, making smart phone lenses probably requires completely different manufacturing plants than SLR lenses. And it might not be profitable to compete with the current producers, smart phone lenses could be far too simplistic for Canon to pursue, it might be that they are simple and even simple sweat shops could produce such in vast numbers. Which is probably why "Zeiss" branded lenses and "Leica" branded smartphone lenses are not made in Germany by the company itself. So, when I'm holding the phone, and i activate the camera, but my hand is getting in the way, so i need to loosen my grip a bit for the motorised cam to slide out and risk dropping the phone. If i held the phone too tightly I might damage the motor. The next one will be sliding on both way, and the opposite way will be a keyboard. The aspect ratio of the screen seems quite extreme, only suitable for panoramas or full length portraits. What happened to 16:9 ? Sadly companies have started inching their way towards 21:9 aspect ratios because people want larger screens but don't want the screens to be any wider, thus we end up with long screens where all media will have pillar bars. There is a solution to this disease ... take a tablet. Most commentators here just exist to comment; after only looking at the title. They can't read the article. "If the images posted by Italian publication Notebook Italia are genuine, "
Want a jar of salt? this is called public rumor and normally it is intentionally leaked from manufacturer. it is what you expect to see in months distance. NOT SOLD ! I am quick to the draw drive-by indiscriminate shooter. No time to pop-up or slide sideways. I want it up front and down back with no fiddling. Keep it simple !!! Not fancy complicated !!! I bet it is not IP68. Anything mechanical easy get screwed by dust and hand sweat ! In that case,the ZTE Axon V will appeal more to you, no sliders at all, with the cameras just on the back, and a small bulge on the side for the front facing camera. I personally prefer that design to a notch which is one of the worst design choices I have seen in years. (in almost every case, the screen area to the sides of a notch cannot be effectively used. My Essential has a tiny notch. Did I just say that out loud? Slide out to take a photograph? So spontaneous? Like the old never ready case? Go to Venice, walk around and watch the selfie generation ... tourism can be really ugly. People walk around with selfie sticks videoing themselves all day. Who would be that starved of entertainment to want to watch the video? Tourism would be uglier if there is no tourist. The "people walk around with selfie stick" is tourist, right? For many of the other sliders I have seen, the sliding action automatically launches the camera app. A really good move by ZTE. I've lost count of the number of smartphone photos that people have sent me, which have been ruined due to dust, thumbprints or other gunge on the lens. No intelligent photographer would fail to protect his front element with a lens cap, but until now no one seems to have given consideration to protecting the lens of a smartphone (admitedly I don't follow smartphone developments closely, so I may be wrong). "but until now no one seems to have given consideration to protecting the lens of a smartphone "
Exactly, you had to make a DIY lens protector. Seems crazy to me that lenses on smartphones aren't protected properly against fingermarks etc. The cost of protector is $0.01. Time making it is less than 1 minute. Should I file the patent before some companies sue me? If you call it a "protector", you'll get sued by Hoya! I don't get this: "no additional display surface is freed up"
Screen covers the whole surface of the phone, and the cameras only slide out when needed. I like the idea. While there are 3 camera holes, from the specs/markings on the camera, it seems like a Single Camera. It is clearly marked f1.7-2.4 and 3.8-19mm (which means it is a 5x zoom camera). And it has a 48MP (Sony IMX586?) Sensor. It's possible that 1 Camera is ToF and another is monochrome for sensor fusion, and hence a 3 camera setup. It's probably marketing speak and it's 3 cameras with digital zoom to fill in the gaps. Actually it Does have a genuine (periscope) zoom. That is why it had 5x Zoom written in it. Also, it's likely that it doesn't have Hybrid Zoom like the Huawei P20 Pro (or the to be announced P30 Pro), and the two cameras arent extra cameras for additional zoom. Thanks, but I'll stick with my Fuji Z900 EXR slider for photography. Awesome little pocket shooter. Who would want more than 5 stops of DR anyway, right? That looks like a REAL flash, doesn't it? lens range goes to 19mm, which means probably 135mm equivalent with 1/3" sensor. Advantage? - optical 5x zoom, the lens module slides forward to zoom. The 3 lens component looks like it has a seam around it, so could slide forward to the distance/depth of the slid-open back - which would prevent accidental pressure on the lens/zoom module mechanism if laid face-down on a table. Just a theory, ...which I realised was not valid but then couldn't delete this message! Er, so why didn't you delete the message during the time when you wrote your last sentence? And unless they've thought of it already, it looks like it'll scratch the lenses if grit gets into the mechanism. While the renders look nice, it seems to be a waste of space as a vertical slider will already fit all front and rear cameras (the periscope telephoto doesn't need to be housed entirely in the exposed portion, only the front element needs to be there). Reminds me of the Sony TX series cameras. If, woulda, coulda, shoulda. Amazing how traditional photographic manufacturers missed the boat. Photography in consumer hands is more vibrant than ever-on smartphones. Where is Nikon, Canon, Pentax, Olympus co-branding on these platforms. Am I just too optimistic or is that a proper xenon flash? I was thinking the same thing! If this has a xenon flash and a real shutter button it would be quite nice! I'm a part of the zte beta test forum and hint hint. volume is the clicker when pressing with a tap. holding it will activate volume. For a long time I wanted real shutter button and was sad nobody cared. Actually Sony did.. Now I guess I just let it go. However with this phone the concept of having a button on the edge seems weird as you just close the phone as you push it. A punched hole for the front camera seems better. The issue with that design is that it limits how effectively you can use that screen space. For example, when dealing with a notch, if an app is not aware of a notch, then content can be obstructed by it, and if they are aware of it, then you often have reduced screen space to work with in most cases. (e.g., look at the Galaxy S10+ and how the camera cutout gets in the way. With no notch or cutout, then every app has the freedom to use the full screen without worrying about "safe zones". I'm talking about a punched hole and not a notch. The punched hole takes up less space than the notch and is less annoyingly placed.